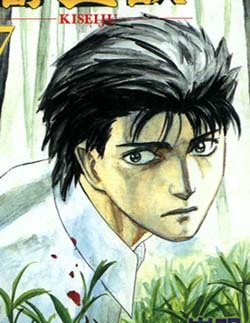 Parasyte is an older series by Hitooshi Iwaaki, which Mixxine began publishing about 2 years ago. It is interesting, but Mixx is a bit slow, which is why I bought the complete japanese set. It is about paraystes that invade human hosts, taking over their bodies and eating other humans for survival. Shin only had his right/left hand invaded (depending on which version you read) and so he still has his wits about him. He gets along with his parasyte, but cannot stand by while other parasytes murder innocent people. This series is very addictive: once you start reading you cannot look away. The story is written very well, with lots of flashbacks and insights into Shin's emotional turmoil, and the different reactions that are very.. human. A bit of related gossip: director James Cameron was inspired by Parasyte for his shapeshifting bad guy in Terminator 2. Some info: Parasyte is available in English from Mixxine and Pocket Mixx: there are currently 2 graphic novels. The Japanese version, Afternoon KC, has an entire set of 10 books. Hitooshi Iwaaki is currently working on another series: Tanabata no Kuni.